Why has mood boarding not been a thing in my life? At the best of times I’m disorganised and indecisive, so to be able to put all my thoughts and inspirational ideas onto one page has been a revelation! One of my favourite subjects at school was Art, probably because I could experiment with pattern and colour (and the teacher was quite handsome...), but the one project that sticks out in my mind? Decorating my A1 sized plastic art folder with a montage of Take That and Westlife photos (I just googled stars of the 90s and where are they now, and now I feel OLD), yin yang stickers and the ubiquitous yellow smiley face. I was already mood boarding and I didn’t know it! As I’ve mentioned before, whilst we were looking for a house to buy, an absolute must and no compromises allowed, was a large kitchen diner. We were living in a house where the kitchen faced the street and I spent many an evening cooking and cleaning and not being able to see the kids playing (fighting) out in the garden, so a kitchen opening out onto the garden was also extremely important. I've always been quite a social person (read that as someone who likes to party and have a drink! ), so I really wanted a social space that was free flowing and easy access to the fridge! I couldn’t believe my luck when our house came up on the market, it had pretty much everything we had on our property list and a renovation project at that! Which meant we could put our own stamp on the property. The kitchen was fabulous, it was a huge bright and airy space, with bi-fold doors opening out onto the garden. The only problem was that the work surfaces were made up of scaffolding boards and gave us less than 2 metres to cook, wash the dishes (the dishwasher was outside, that's another story!) and pour me Prosecco. It was screaming out for a whole new kitchen and my dream, an island! I wanted to make the whole room as versatile as could be, with a dining table and corner sofa, so when we had family and friends over, we could all socialise in one room. I think one of my first ever pins on Pinterest was this image of a shaker style kitchen. I loved the simple but stylish decor and the curved units definitely appealed to my Mum brain. The original “dining room” part of the kitchen still had the chimney breast in with a working wood burner, but as we worked out the layout of how we wanted our kitchen to be, unfortunately the wood burner had to go. 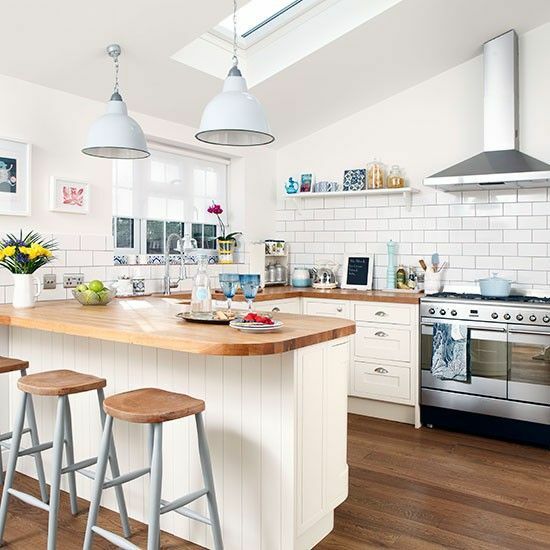 I had seen many pictures of beautiful farmhouse kitchens on Pinterest and I loved how some renovators had incorporated their oven into the chimney breast. I really wanted to make a feature out of this, so started looking at tiles to use as a splash back. I was going with white metro tiles, until I came across this picture and loved the use of pattern as a splash back! I was then googling patterned tiles until the early hours of the morning! As for the colour scheme? I’m a firm believer in finding one piece, whether that be furniture, a cushion, a piece of art, or in my case, salt and pepper shakers to create the basis of colour for your room. When we first moved back to the UK from Saudi Arabia, we were put in a beautiful rented detached house in the country but had absolutely no furniture or accessories to fill it with, not even a knife and fork! We were given army furniture which consisted of a three piece suite that had probably belonged to the army since 1956 and was covered with the most hideous scratchy dark blue nylon material and a few Argos coffee and side tables. One afternoon The Mother and I made a mad dash to the local Asda superstore whilst Mr B stayed at home with the baby and we bought as many essentials as we could fit into the trolley. Think of it as a Supermarket Sweep without Dale and not a grocery in sight! 😊 I grabbed these salt and pepper shakers in haste, but I loved the colour of them so much, my whole kitchen colour scheme grew from these items. They don't work - just for decorative purposes only! And so, there we have it! 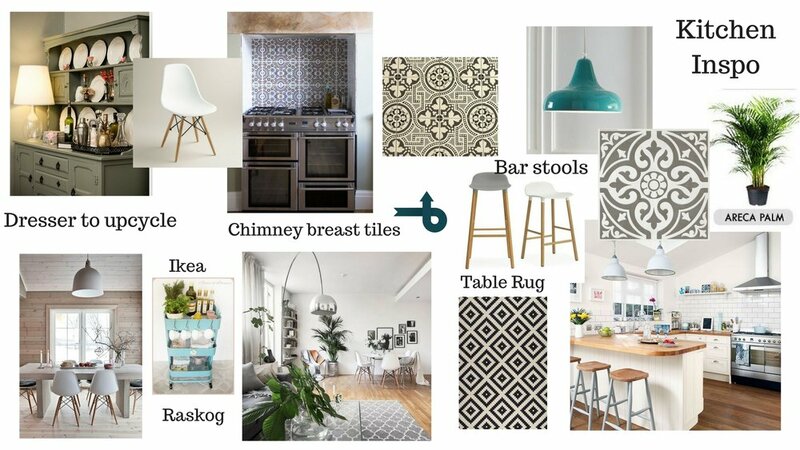 My first venture into an Interior related mood board and I can seriously say I’m addicted! It really does help determine whether items will go together and to show other people what your design aspirations are, instead of trying to explain what you see in your head (and get frustrated, like I used to do, because why could no one else see my vision?!? 😊) Now, if I could just mood board a new wardrobe for Mr B, I’m winning at life! Hastings - And the Battle to keep the kids happy!